Tuesday’s matchup against Colorado marks the first time the Blackhawks will skate on United Center ice since Jan. 26 against Winnipeg, a span of eight games. Chicago went 4-2-2 in that time, most recently rolling past Pittsburgh 5-1 in the Stadium Series matchup on March 1 at Soldier Field. The team will be without winger Marian Hossa for the next 2-3 weeks after the veteran sustained an upper-body injury in Saturday’s victory, which will force Head Coach Joel Quenneville to adjust a top line that has remained consistent all season long. While many an NHL team – the Blackhawks included – rely on a strong puck possession game to succeed, the Avalanche do not; in their 39 wins this season, they have been outshot by their opponent 25 times, and their .735 winning percentage when being outshot is second-best in the league. The main reason for their success has been the play of goaltender Semyon Varlamov, who ranks among the league’s top 10 in save percentage, and whose 1,398 saves this year are second-most in the NHL. It’s tough to beat Varlamov off the first attempt, so it will important for the Blackhawks to get traffic to the front of the net in order to take advantage of any rebound opportunities. Although the Avalanche are (justifiably) lauded for their group of forwards, their blue line has been noticeably more effective in the opponent’s zone this year. Colorado defensemen have netted 33 goals through 61 games this season, after scoring just five times in 48 games last year. Erik Johnson and Tyson Barrie lead Colorado defensemen with eight goals apiece, and Nick Holden potted a pair of goals in the third period of Sunday’s comeback win against Tampa Bay. Avalanche coach Patrick Roy credits the team’s forwards with taking on a greater role on the team defensively, which has freed the d-men to join the rush and help more in the transition game. Blackhawks fans should be used to Jonathan Toews performing on the biggest stages, but he once again surprised and delighted at Soldier Field on Saturday. The captain scored twice against the Penguins and assisted on Patrick Sharp’s first-period goal, tying the NHL record for most points in a regular-season outdoor game. 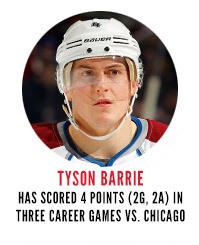 He also notched his 20th goal of the year in the game, the seventh time he’s reached the mark in seven NHL seasons. Many prognosticators predicted a Blackhawks-Blues battle for the top of the Central Division, but few foresaw Colorado making it a three-way fight. The NHL’s most competitive division is loaded at the top, with three points separating St. Louis, the Blackhawks and Colorado for the top spot. With just 20 games to go in the regular season, and a combined four games against the Blues and Avs remaining, how the Blackhawks perform in these matchups could make the difference in playoff seeding. Chicago has gone just 1-1-1 in their three games against Colorado this year. In their last meeting, Chicago managed to get 48 shots on net against Varlamov, but netted just two goals in an overtime loss. The Blackhawks must contain the Avs’ potent group of forwards, including Matt Duchene, Gabriel Landeskog and Nathan MacKinnon, and do their best to keep Varlamov from tracking the puck. With two points on the line in a tough divisional race, the importance of this game will only be magnified more.